I think there is a relationship, but perhaps SEO is not the right word. Jeremy is correct, PR is about content and relationships. However, content and relationships can lead to good natural search engine positioning. It’s sometimes a side benefit. SEO implies doing things specifically to target the engines. I have never been a fan of the SEO crowd, mostly because of a few unethical ones (a common issue that the SEO industry faces). People like Teresa Caro help change that perception though. When I consult with clients and help them develop blogs and web sites I do things that might help them with search result listings. It’s amazing how developing good content that is relevant and contextually linked is looked favorably upon by the search engines It’s not my fault that findability is a good thing. In reality, it’s mostly common sense and making sites usable for the visitors. Some PR folks will tell you that press releases are a waste of time. I guess that comes from all those lazy PR folks out there that didn’t get any results from mindlessly blasting boring press releases to the media masses. Those in the PR industry should pay attention to Marcom Blog. Sure the posts are good, but pay particular attention to the comments. The majority of comments are by PR students. They are the ones that will be working in the industry within a few years, and perhaps leading it in a decade. Read how they view blogs and their impact/relation to PR. They are the first of the ‘blogging graduates’. Man I am getting older. When I read Stephen Davies’ question about what PR was like before the Internet arrived I realize I am getting long in the tooth. I was there in the stone ages. Discussing PR before the Internet deserves a post in its own right. All I’ll say right now is that we were still busy, but busy on different things. And don’t get me started on research before the Internet…. Things are changing, but we can watch it happen. I agree with Neville, there is so much great content over at Global PR Blog Week 2.0, but little time to read it now. I am trying to read as many articles as I can, but a heavy workload and some speaking engagements this week make it tough. Luckily the articles will still be up once the event is over (that’s what permalinks are for). While battling reliability and scaling issues Technorati is forging ahead with new services. David Sifry announced the launch of their Blog Finder service. The basic premise is to rank blogs by category or technically speaking, by tags. David says in his blog that new service answers the question, “How can you find authoritative blogs on a subject?” This is what Robert Scoble was asking for on Monday. I took a quick look around at the new service this evening and here are my initial impressions. I am also listed as the Most Authorative blog for ‘Orlando’ even though I rarely write about Orlando. Why? I guess becuase I have tagged more posts Orlando than other bloggers. There are other issues as well. In the ‘PR’ search, Neville’s blog is listed in three places, under three different URLs. (nevon.net/nevon/, nevon.typepad.com and nevon.typepad.com/nevon/) This is due to the fracturing of data within Technorati’s index. If you remember Neville discovered this when he was having problems with Technorati’s search tool. Also Steve Rubel is not listed under ‘PR’ or ‘Public Relations’, but he is second for ‘Podcasting’ behind Dave Winer. If you have a Technorati account and have claimed your blog, you can specify the tags you want associated with your blog. I looked at this option and it does allow you to specify up to 20 tags for your blog. One problem I noticed though was it didn’t always save my changes. I removed a few generic tags such as ‘Stuff’ (one of my categories) and replaced it with something else. A few minutes later I returned to the entry screen and a number of tags were repeated and some of my original tags were no longer there. Hopefully they’ll fix this. Overall this should be a very talked about feature. The initial bugs I noticed should be able to be cleaned up. We’ll see how the rest of the blogosphere reacts in the coming days. And unfortunately, we’ll also see how soon the spammers begin to manipulate the results. Update 9.2.05 #1 Robert Scoble has noticed one of the issues I saw last night. Robert was able to make his blog the Most Authorative blog about ‘Apple’. Last night I entered the tag ‘Tampa’ for my blog via Technorati’s configuration tool and I became the Most Authorative blog about Tampa, even though I never write about Tampa. Update 9.2.05 #2 BL says she’s surprised that her blog is #1 for ‘Public Relations’. Update 9.2.05 #3 Tris Hussey has his review/thoughts on the new service. Update 9.2.05 #4 I’ve posted some further analysis on Blog Finder. 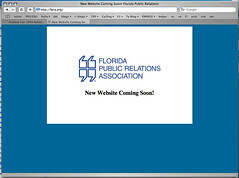 The Florida Public Relations Association has been developing a new web site which was planned to launch in combination with their annual conference next week. Three days before the annual conference they took down the old site and put up a placeholder (shown below). Anybody looking for last-minute information about the conference was out of luck. Hopefully they’ll get the web site launched soon or at least post some information about the conference. For now here is a link to the basic information and the student track. The release is targeted at the media, not at everyone else. To those of you who think that blogs are the new press release do this (as I have done many times). Go down to you local paper and ask anybody in the newsroom if they are using RSS or blogs to receive information, let alone press releases. Chances are you will get some blank stares. Now you can go back and tell your client that this great press release replacement you’ve created isn’t being used by a single reporter at the paper. They’ll be thrilled about that. I am in the process of updating my Guide to Media Monitoring I wrote back in January of this year. I am planning on including all the new blog search tools and custom RSS watchlists/feed services. There will also be some information about tags, specifically dealing with monitoring tags via Technorati/del.icio.us/Flickr, etc. The guide is mostly geared towards communicators, but just about any user can learn something from it. Anything you think I should include? Perhaps some service that I might not have heard of? Leave a comment. I have quite a busy week this week so posting will be less than normal. I am working on quite a few IA and blog projects. - Jen has started her blog. One of the things she’ll be blogging about is her volunteer PR work at NASA for the launch this week. That should be cool to read. - Stephen talks about the paid model for various online services, i.e. Flickr, Feedburner and FeedLounge. - Business Week blogs about the battle between the web edition and the blog, where to post a story? - I pointed Frank to a clueless Sports Illustrated columnist. Also SI should not call their online columns blogs. They offer no comments, or any other feedback mechanism. Robert French has posted a series of questions about transparency in PR/blogging, specifically directed at Steve Rubel. Robert brings up some interesting points, which I assume Steve will respond to. Back in April, I talked about ‘claims of transparency’ related to some of the public records laws we have in Florida. My original post stirred some interest from Neville Hobson, who I mentioned. I told Neville that I wasn’t calling him out; I just knew that he often talked about the perceived transparency of other blogs. when a blogger or company say they are being transparent are they really? Let’s take a look at your e-mail? phone logs? how about your financial transactions? …For now I will take any claim of ‘transparency’ with a grain of salt. Sort of a “look over here!” distraction. Making a big deal out of the fact that you are “transparent” only makes me suspicious that you are hiding something. It’s sort of like when somebody says, ‘Trust me.’ So you’re saying you weren’t telling me the truth before? Sorry for the light notes at the end of Session 3 I caught myself doing too much listening and not enough typing. Mandelyn C. Hutcherson has notes from Session 1. She took them with her Tablet PC so she is going to convert them over and send them along. I will post them as soon as I receive. After the conclusion of the session I had a few moments to show the participants EPIC. For many (if not all) in the audience this was their first exposure to the now famous video. Overall it was a great experience. I got to talk to a number of practitioners that are interested in blogging. The majority are looking at the listening and monitoring aspect and not engagement. RSS and RSS agregators are the tool for them. Only a handful of those in the audience had experience with RSS, but I think we will have quite a few converts. Off to Nashville for BlogNashville. Last week during my trip to Atlanta I drove over to Auburn University on Wednesday to visit Robert French and speak to one of his PR classes. As always it was great to put a face with a blog or I should say blogs since I also met many of the student bloggers. I spoke for about 40 minutes to the students on a variety of subjects: how I got started, how I am working with PR firms, what blogs can and can’t do etc. I think most importantly though I related to them the power of the knowledge and experience they are gaining by blogging. I told them that I speak to many PR professionals around the country and many know nothing about blogs. Their experience will give them a competitive advantage in the job market. Robert recently posted a Target job listing that required knowledge of blogs. His students have that experience. I taught at a local college as an adjunct for a number of years, but stopped because of time commitment involved. What I miss though is the student interaction. Contributing to Marcomblog helps fill that void. The opportunity to get back on a campus such as AU and talk to students is also great. Robert said the real eye-opener for the PR department was a PRSSA seminar held in March of this year. The topic turned to blogs and the Auburn students were the only ones to be on the Cluetrain. Some of the students blogged about this experience. When blogs were brought up during the presentation, out of 3 other schools, only Auburn students seemed to know much about blogs or have them. There may have been a few exceptions, but few would be the key word. I really felt like it put me slightly ahead of the students from other schools. Robert also told me about some of his previous blogging PR students and the projects they have pitched or started at their jobs. I am not sure if some of the plans are public knowledge so I will hold off on talking about them in detail. Needless to say some of them are big. How long will this ‘Auburn Advantage’ last? We’ll see, but right now Robert’s students are reaping the rewards. My time was limited, so I set off for Atlanta. My wife is an Auburn alum so we come up for football games in the fall. I told Robert that I’d see him sometime later this year, and would make it a point to have an extended weekend trip to visit a class in the fall. I am glad I made the trip over.